Loyalty is usually associated with dogs (and apparently horses too - when you google it!) but I think cats are just as capable of feeling loyalty to their owners. Our Burmese cat is so friendly she sits at the end of our driveway and waits for people to walk past and pat her. She's even been known to follow them down the footpath when they decide to leave. Where being loyal comes into the picture is knowing that she will stop at the end of our property and turn around and come home. A few people have stopped, picked her up and brought her to our front door thinking she would keep following them down the street, but she won't, she knows where she belongs and who she belongs with. Friendships are like that, we can have plenty of friends but our true friends can be depended upon to choose loyalty above self interest. They will have our backs and support us when we need them. They will go the extra mile for us and we know we can trust them to have our best interests at heart. Midlife has taught me that loyalty and integrity are getting harder to find, when you have a loyal friend, you have a friend for life. Knowing our cat will always come home and knowing my friends will have my back are both integral to my world view. I can trust them both - I know Flit won't trade me in for a friendly patter and I know my friends won't trade me in for a "better offer". Your cat sounds so cute. 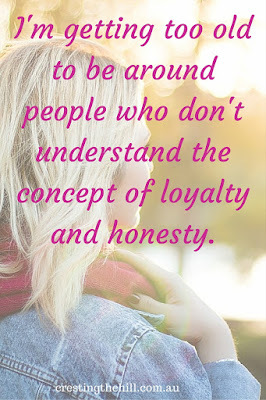 It is true loyalty and integrity are getting harder to find. When we do have someone in our lives who demonstrates these qualities we must cherish them. Your cats are very wise! I agree Melissa - loyalty is such a valuable commodity in friendship isn't it? Oh sister. I am too damn old to hang with those – feline or human – – who do not understand loyalty either. Exactly Carla! If you can't trust your friends to be loyal then why waste your time? I love this Leanne! Sometimes people take the GodFather attitude which can be Ok or not at all from the heart. It's about integrity and trust isn't it Haralee - knowing your friends value you enough to have your back. I love this! I have one friend in particular who is the epitome of 'loyalty'. After thirty years, she is still there. Still supporting. Still defending. Still encouraging. Everyone should have a friend like her! It works both ways Diane and I bet she would say exactly the same thing about you - true friendship like that is such a blessing! 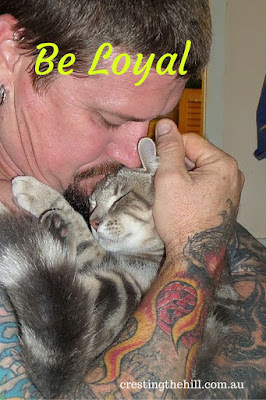 I love the pic of the guy with the tattoos loving up the cat. No wonder it's so loyal! And, it's great to have friends who stay in your corner no matter what. I loved it too Rebecca - it shows his heart and that is the essence of what attracts loyalty. I hear ya sister! True friendship is hard to find. When you do, cherish it! True friendship grows in value with every year Ellen - those special friends who hang in there through thick and thin are the absolute best. I'm with you. One of the great things about being 61 is that I've got some terrific pals who have proved themselves to be on my team, through thick and thin, for decades. Those friends are just gold aren't they Roz? I have a few too and they are worth so much more than they realize. Loyalty is good. Love is better. I love my cats. My cats are not loyal, but they love me. Real friendship is love. I agree Nancy because love and loyalty are intertwined - I don't think one authentically exists without the other. Agree - loyalty and integrity are so important. I'm glad I have people in my life who fit both of those categories! They are such valuable traits in this disposable society we live in Lois - to know someone will be there for you despite "better offers" is really special. Loyalty and integrity are sadly becoming a thing of the past, Leanne. Fortunately for me I have friends and family who still have this trait and hopefully I can teach Ethan to be the same. We definitely need to hand it down to the generations to follow Sue- I think that's one of the "jobs" of grandparents - to reinforce these values. I was talking about loyalty today as a matter of fact. It's invaluable. It is priceless isn't it Carol - so undervalued at times though. You are right - and as we get older, there friends who have been loyal and stuck around for years are our most cherished. My cats always come home too. I even have one who comes and meows at me when she wants me to come to bed! I love that cats are so much more "into" us than people often realize Cathy - they love us and their loyalty is such an example to humans! 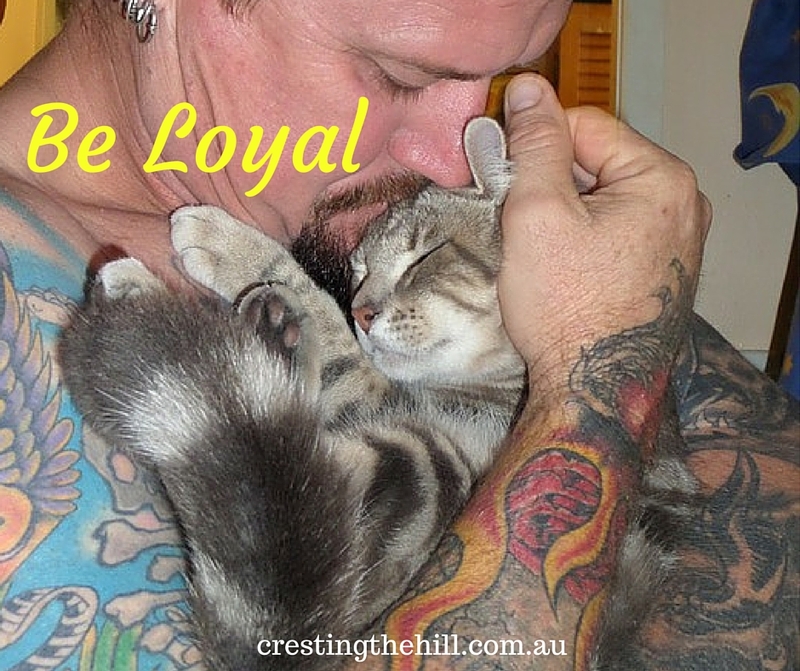 Pets certainly teach us about loyalty and unconditional lo even, don't they? I'm definitely a dog person, although I do love our 2 cats. My naughty Chihuahua has my whole heart, however, and damn if he doesn't know it. You could say he's got me wrapped around his little paw. Ha ha. But they, and my good human friends too, are as you said: integral to my world view. Loyalty is the quality I value most in a friendship. The older I get, the more I realize how little time I have left, and the more I choose to spend that time with those who are precious to me. True friends are a treasure. And the last cat I had showed similar traits to yours, Leanne. I love dogs, but I agree that cats can be loyal too. When you experience loyalty from a friend or a pet you know that you wouldn't accept anything less than that from the people you allow into your inner circles Molly. Loyalty is a valuable trait and it's good to find people with it. I do suspect my cat is mostly loyal to her food, not us, however! I have been fortunate enough to find some really loyal friends the past couple of years. It has made all the difference as I navigate through life. I think I would count loyalty as one of my top three qualities I want in my friends these days!